Sand and gravel are mined world-wide and account for the largest volume of solid material extracted globally. Formed by erosive processes over thousands of years (John, 2009), they are now being extracted at a rate far greater than their renewal. Furthermore, the volume being extracted is having a major impact on rivers, deltas and coastal and marine ecosystems (Figure 1), results in loss of land through river or coastal erosion, lowering of the water table and decreases in the amount of sediment supply. Despite the colossal quantities of sand and gravel being used, our increasing dependence on them and the significant impact that their extraction has on the environment, this issue has been mostly ignored by policy makers and remains largely unknown by the general public. Globally, between 47 and 59 billion tonnes of material is mined every year (Steinberger et al., 2010), of which sand and gravel, hereafter known as aggregates, account for both the largest share (from 68% to 85%) and the fastest extraction increase (Krausmann et al., 2009). Surprisingly, although more sand and gravel are mined than any other material, reliable data on their extraction in certain developed countries are available only for recent years (Krausmann et al., 2009). The absence of global data on aggregates mining makes environmental assessment very difficult and has contributed to the lack of awareness about this issue. One way to estimate the global use of aggregates indirectly is through the production of cement for concrete (concrete is made with cement, water, sand and gravel). The production of cement is reported by 150 countries and reached 3.7 billion tonnes in 2012 (USGS, 2013a). For each tonne of cement, the building industry needs about six to seven times more tonnes of sand and gravel (USGS, 2013b). Thus, the world’s use of aggregates for concrete can be estimated at 25.9 billion to 29.6 billion tonnes a year for 2012 alone. This represents enough concrete to build a wall 27 metres high by 27 metres wide around the equator. Added to this are all the aggregates used in land reclamation, shoreline developments and road embankments (for which the global statistics are unavailable), plus the 180 million tonnes of sand used in industry (USGS, 2012). Aggregates also contribute to 90% of asphalt pavements and 80% of concrete roads (Robinson and Brown, 2002). China alone built 146,400 kilometres of road in one year (EDE, 2013) — an indication of the world demand for aggregates. Taking all these estimates into account, a conservative estimate for the world consumption of aggregates exceeds 40 billion tonnes a year. This is twice the yearly amount of sediment carried by all of the rivers of the world (Milliman and Syvitski, 1992), making humankind the largest of the planet’s transforming agent with respect to aggregates (Radford, 2005). This large quantity of material cannot be extracted (Figure 1) and used without a significant impact on the environment (Sonak et al., 2006, Kondolf, 1994). Extraction has an impact on biodiversity, water turbidity, water table levels and landscape (Table 1) and on climate through carbon dioxide emissions from transportation. There are also socio-economic, cultural and even political consequences. In some extreme cases, the mining of marine aggregates has changed international boundaries, such as through the disappearance of sand islands in Indonesia (New York Times, 2010; Guerin, 2003). The demand for aggregates stems from a wide range of sectors, including production of glass, electronics and aeronautics. However, its largest use is in construction (see example on Dubai in Box 1) and land reclamation (see example on Singapore in Box 2). The trend for aggregates extraction can be estimated using cement production as a proxy. This has multiplied three-fold in the last 20 years from 1.37 billion tonnes of cement in 1994 to 3.7 billion tonnes in 2012 (USGS, 2013a) mainly as a result of rapid economic growth in Asia (UNEP and CSIRO, 2011), and spurred by China’s development, which in 2012 absorbed 58% of the world cement production, or 2.15 billion tonnes (Figure 2). Five countries — China (58%), India (6.75%), the United States (2%), Brazil and Turkey — produce 70% of the world’s cement (USGS, 2013c). However, cement demand by China has increased exponentially by 437.5% in 20 years, while use in the rest of the world increased by 59.8% (Figure 2). Each Chinese citizen is currently using 6.6 times more cement than a U.S. citizen (USGS, 2013a). Demand continues to increase with new infrastructure and renewal of existing infrastructure (roads, bridges, dams, houses) — all dependent on the availability of aggregates. Sand was until recently extracted in land quarries and riverbeds; however, a shift to marine and coastal aggregates mining has occurred due to the decline of inland resources. River and marine aggregates remain the main sources for building and land reclamation. For concrete, in-stream gravel requires less processing and produces high-quality material (Kondolf, 1997), while marine aggregate needs to be thoroughly washed to remove salt. If the sodium is not removed from marine aggregate, a structure built with it might collapse after few decades due to corrosion of its metal structures (Delestrac, 2013). Most sand from deserts cannot be used for concrete and land reclaiming, as the wind erosion process forms round grains that do not bind well (Zhang et al., 2006). In developing countries, mining and dredging regulations are often established without scientific understanding of the consequences, and projects are carried out without environmental impact assessments (Maya et al., 2012; Saviour, 2012). As a result, aggregate mining has affected the provision, protection and regulation of ecosystem services. The mining of marine aggregates is increasing significantly. Although the consequences of substrate mining are hidden, they are tremendous (Figure 3). Marine sand mining has had an impact on seabed flora and fauna (Krause et al., 2010). Dredging and extraction of aggregates from the benthic (sea bottom) zone destroys organisms, habitats and ecosystems and deeply affects the composition of biodiversity, usually leading to a net decline in faunal biomass and abundance (Desprez et al., 2010) or a shift in species composition. Long-term recovery can occur only where original sediment composition is being restored (Boyd et al., 2005). Aggregate particles that are too fine to be used are rejected by dredging boats, releasing vast dust plumes and changing water turbidity, resulting in major changes to aquatic and riparian (i.e. river banks) habitats over large areas (Ashraf et al., 2011). The mining of aggregates in rivers (Figure 4) has led to severe damage to river basins (Sreebha and Padmalal, 2011), including pollution and changes in levels of pH (Saviour, 2012). Removing sediment from rivers causes the river to cut its channel through the bed of the valley floor (or channel incision) both upstream and downstream of the extraction site. This leads to coarsening of bed material and lateral channel instability. It can change the riverbed itself (Kondolf, 1997). The removal of more than 12 million tonnes of sand a year from the Vembanad Lake catchment in India has led to the lowering of the riverbed by 7 to 15 centimetres a year (Padmalal et al., 2008). Incision can also cause the alluvial aquifer to drain to a lower level, resulting in a loss of aquifer storage (Kondolf, 1997). It can also increase flood frequency and intensity by reducing flood regulation capacity. However, lowering the water table is most threatening to water supply (Myers et al., 2000) exacerbating drought occurrence and severity as tributaries of major rivers dry up when sand mining reaches certain thresholds (John, 2009). 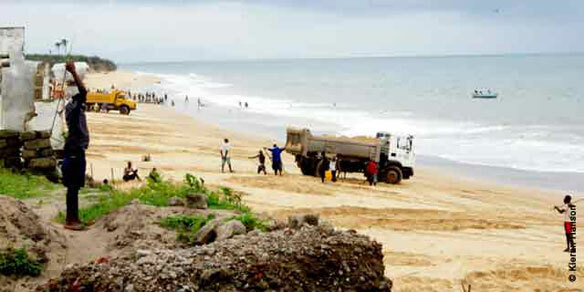 Erosion occurs largely from direct sand removal from beaches, mostly through illegal sand mining. It can also occur indirectly, as a result of near-shore marine dredging of aggregates, or as a result of sand mining in rivers (Kondolf, 1997). Damming and mining have reduced sediment delivery from rivers to many coastal areas, leading to accelerated beach erosion (Kondolf, 1997). Onshore sand mining in coastal dune systems such as those in Monterey Bay, California, in the United States, can also lead to long-term erosion, in this instance, 0.5 to 1.5 metres a year (Thornton et al., 2006). By 2100, global average sea level rise is expected to reach 0.26 to 0.55 metres under the best-case scenario (of 70% reduction of greenhouse gas emissions), and nearly one metre under unabated increase in greenhouse gas emissions (IPCC, 2013a). This problem is particularly acute for small islands states, where retreat options are limited. In the Maldives, a few of the largest and highest islands, such as the capital city, Male, are being consolidated to ensure they can host the population displaced from low-lying islands (Figure 5). To strengthen the city, a large amount of sand is being imported to Male, to be used in building higher towers and coastal protection. The sand is taken from offshore sand islands. Paradoxically, the sands extracted for the protection measures in Male are leading to the lowering of some islands, increasing the need to relocate their populations (Delestrac, 2013). Lake Poyang, the largest freshwater lake in China, is a distinctive site for biodiversity of international importance, including a Ramsar Wetland. It is also the largest source of sand in China (De Leeuw et al., 2010) and, with a conservative estimate of 236 million cubic metres a year of sand extraction, may be the largest sand extraction site in the world. By comparison, the three largest sand extraction sites in the United States combined represent 16 million cubic metres a year (De Leeuw et al., 2010). Sand mining has led to deepening and widening of the Lake Poyang channel and an increase in water discharge into the Yangtze River. This may have influenced the lowering of the lake’s water levels, which reached a historically low level in 2008 (De Leeuw et al., 2010). The city of Dubai in the United Arab Emirates is among the world’s most spectacular architectural developments, albeit one that has put significant pressure on marine aggregates. The Palm Jumeirah, an artificial set of sand islands (see below), required 186.5 million cubic metres (385 million tonnes) of sand and 10 million cubic metres of rock, and cost US$12 billion (Jan De Nul group, 2013). Its own marine sand resources being exhausted, Dubai imported sand from Australia, for example, to build the Burj Khalifa tower (Delestrac, 2013), the highest building in the world at 828 metres. While such development is impressive, in 2013, 31% of office space was vacant in the centre of Dubai (Jones Lang LaSalle, 2013). The Palm Jumeirah was quickly followed by a second Palm project, The Palm Jebel Ali, and then by The World islands project, a set of 300 artificial islands representing a map of the world. The World project cost US$14 billion to construct and required 450 million tonnes of sand. Only a very small number of these islands currently host infrastructures. These land reclamation projects exhausted all of the marine sand resources in Dubai (Delestrac, 2013). 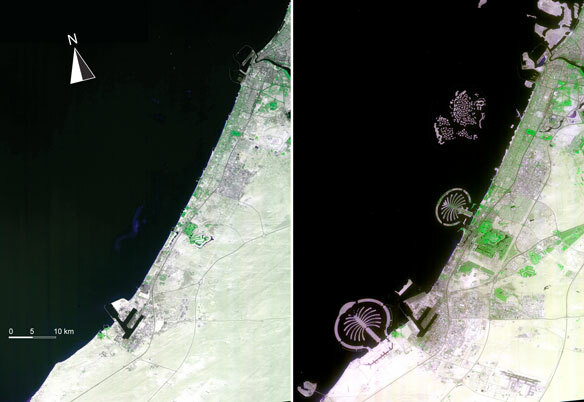 Left: Dubai February 2002 ASTER image. Right: July 2012 ASTER image. The two Palm islands and The World artificial islands required more than 750 million tonnes of sand. Images processed and analysed by UNEP/GRID-Geneva. The transport of large quantity of aggregates, sometimes over long distances, has a direct impact on greenhouse gas emissions. The indirect impacts of aggregate mining come from the production of cement. For each tonne of cement, an average of 0.9 tonnes of carbon dioxide are produced (Mahasenan et al., 2003; USGS, 2012). The Carbon Dioxide Information Analysis Center (CDIAC) estimates that 1.65 billion tonnes of carbon dioxide emissions were from cement production in 2010 alone, or nearly 5% of total greenhouse gas emissions (EDE, 2014). Total carbon emissions from cement amount to eight billion tonnes of carbon (equivalent of 29.3 billion tonnes of carbon dioxide) (IPCC, 2013b, p. 474) and has increased from 3% in the 1990s to 4% of greenhouse gas emissions from 2000 to 2009 (IPCC, 2013b, p.489). Aggregates are, in most cases, a free resource, but their extraction comes at the expenses of other economic sectors and local livelihoods. Tourism may be affected through beach erosion (Kondolf, 1997), while fishing — both traditional and commercial — can be affected through destruction of benthic fauna (Cooper, 2013; Desprez et al., 2010). Agriculture could be affected through loss of agricultural land from river erosion (John, 2009) and the lowering of the water table (Kondolf, 1997). The insurance sector is affected through exacerbation of the impact of extreme events such as floods (Kondolf, 1997), droughts (John, 2009) and storm surges through decreased protection of beach fronts (Thornton et al., 2006). The erosion of coastal areas and beaches affects houses and infrastructure (Thornton et al., 2006; John, 2009). A decrease in bed load or channel shortening can cause downstream erosion including bank erosion and the undercutting or undermining of engineering structures such as bridges, side protection walls and structures for water supply (John, 2009; Padmalal et al., 2008). 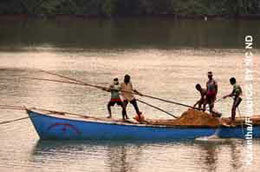 A lack of proper scientific methodology for river sand mining has led to indiscriminate sand mining (John, 2009), while weak governance and corruption have led to widespread illegal mining (Saviour, 2012; Ashraf et al., 2011). Sand trading is a lucrative business, and there is evidence of illegal trading such as the case of the influential mafias in India (Ghosh, 2012). In Morocco, half of the sand – 10 million cubic metres a year – comes from illegal coastal sand mining (Au fait, 2011). 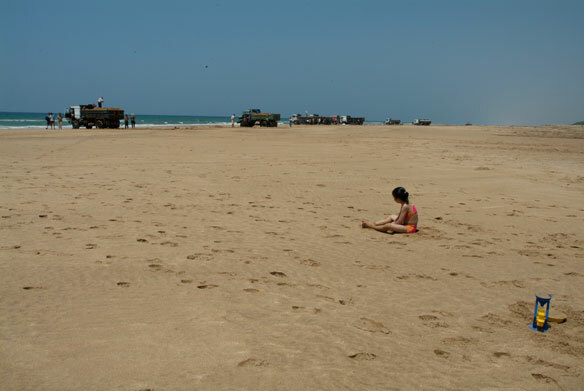 Sand smugglers have transformed a large beach into a rocky landscape between Safi and Essouira (l’Economiste, 2005; Khardijamal, 2011). Sand is often removed from beaches to build hotels, roads and other tourism-related infrastructure. In some locations, continued construction is likely to lead to an unsustainable situation and destruction of the main natural attraction for visitors — beaches themselves. The lack of adequate information is limiting regulation of extraction in many developing countries (Sreebha and Padmalal, 2011). Access to data is difficult, and data are not standardised. There is limited collaboration/co-ordination between the marine scientific research establishments and the marine aggregates industry (Velegrakis et al., 2010). Except in the European Union, regulation efforts are few, especially in developing countries (Sreebha and Padmalal, 2011). Lack of monitoring systems, regulatory policies and environmental impact assessments have led to indiscriminate mining, triggering severe damage to the environment and related ecosystem services. Singapore is developing rapidly and its population has increased by a factor of three since 1960, from 1.63 million to 4.84 million inhabitants in 2010. Given its small area, Singapore needed more space for its infrastructure development. To respond to this demand, the city has increased its land area by more than 20 in the last 40 years (an addition of 130 square kilometres), mostly by using aggregates to reclaim land from the sea (see map). A map of Singapore shows its area increasing from 1973 to 2013. Remote sensing analysis: UNEP/GRID-Geneva. Having imported a reported 517 million tonnes of sand in the last 20 years, Singapore is by far the largest importer of sand world-wide (UN Comtrade, 2014; Aquaknow, 2014) and the world’s highest per capita consumer of sand at 5.4 tonnes per inhabitant. Sand is typically imported mostly from Indonesia, but also from the other neighbouring countries of Malaysia, Thailand and Cambodia. Export of sand to Singapore was reported to be responsible for the disappearance of some 24 Indonesian sand islands. It is reported that this triggered political tensions regarding maritime borders between the two countries (New York Times, 2010; Guerin, 2003). 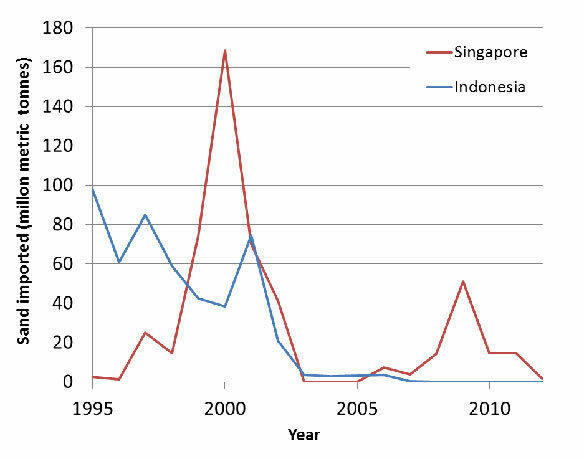 Indonesia’s reported sand exports to Singapore versus reported imports by Singapore from Indonesia in millions of tonnes. Data sources UN Comtrade 2014 (Natural sand except sand for mineral extraction, 1995-2012). The reported sand exported from Indonesia to Singapore declined sharply since a temporary ban declared in February 2002 (Guerin, 2003). Other neighbouring countries are now reporting few exports to Singapore. Overall, the reported total amount of sand imported by Singapore (517 million tonnes) and the sum of sand exports to Singapore from its four neighbouring countries (637 million tonnes) does not match (see graph left), showing an underestimation of 120 million tonnes of sand imports. Obviously, these statistics do not include illegal imports and highlight the need for better monitoring. There is also an alleged illegal sand trade (Global Witness, 2010). As the price of sand increases, so does the traffic of sand by local mafias (Global Witness, 2010; Milton 2010; Handron, 2010). The average price of sand imported by Singapore was US$3 per tonne from 1995 to 2001, but the price increased to US$190 per tonne from 2003 to 2005 (UN Comtrade, 2014). One way to reduce consumption of sand is to optimise the use of existing buildings and infrastructure. Recycled building and quarry dust material can be a substitute for sand. Despite the very high value of minerals found in the sand, it is mostly used for concrete or is buried under highways. Concrete rubble should be recycled to avoid using aggregates, at least for low-quality uses (Kondolf, 1997). Recycling glass bottles would also reduce sand consumption. Substitutes for sand are available. Khamput (2006) showed that quarry dust could be used to replace sand in general concrete structures. The replacement of sand by up to 40% of incinerator ash exhibits higher compressive strength than regular cement mortars (Al-Rawas et al., 2005). Some desert sand can be used if mixed with other material (Cisse et al., 2012; Zhang et al., 2006). There are alternatives for building houses, including wood, straw and recycled material. However, the current building industry is geared toward concrete know-how and equipment. Training of architects and engineers, new laws and regulations, and positive incentives are needed to initiate a shift for lowering our dependency on sand. Renewable and recycled materials need to be targeted for building houses and roads. The current situation will continue unless sand extraction is correctly priced and taxed so that other options become economically viable. Despite the increasing rarity of sand, in the United States the price of sand has remained very stable, fluctuating from US$4.50 to US$6.7 a tonne between 1910 and 2013 (USGS, 2012) . Because sand is still very cheap – sand itself is freely accessible; only extraction costs need to be covered – there is little or no incentive to induce a change in our consumption. Alternative sources of sand and gravel, which accumulate at the bottom of dams, can also be targeted. Their use would address the problem of these aggregates accumulating which leads to a reduced capacity of dams to store water and could result in the dams’ water intakes being blocked. Dams regularly release large amounts of water to flush out aggregates. Although currently more expensive, aggregates could be extracted from the dams. Whilst it is critical for political leaders to take appropriate measures, the mining of aggregates has not yet reached their political agenda. This is primarily because sand loss has not yet reached a level of scarcity that would threaten the economy. Few, if any, measures are being implemented (See Box 3), with the notable exception of the European Union, and the United Kingdom in particular (Velegrakis et al., 2010; Tillin et al., 2011). There is a need for regulating sand extraction in both national and international waters. Experts recommend that large-scale mining, quarrying and reclamation activities should be authorized only after sound scientific assessment shows there would be limited impact on the environment (Maya et al., 2012). Other policy actions include the introduction of scientific mining operations, followed by ecological restoration. Greater consideration of substitute and sustainable use of the resource could drastically reduce impact on the environment (Chauhan, 2010). Activity-based regulations and land and marine protection are the two policy frameworks that govern extraction of aggregates. Land and marine protected areas do include restrictions on extraction of aggregates within their limits. However, extractions near these protected areas can indirectly affect these sites, such as in the case of sand extraction near Poyang Lake in China (a Ramsar site), which affected the lake water level and turbidity. No international conventions regulate the extraction, use and trade of land-based sand (sand quarry, riverine and lake aggregate). Due to operational costs, most marine aggregate extractions are carried out at short distances from landing ports and at water depths of less than about 50 metres. As these activities occur close to shore, they generally are under national jurisdictions. The same applies to Exclusive Economic Zones or to the Continental Shelf, where coastal states exercise sovereign rights to explore and exploit natural resources (Radzevicius et al., 2010). Hence the need to have appropriate national policies. Several important international conventions exist. The United Nation Convention on the Law of the Sea, 1982 (UNCLOS) provides for the delimitation of maritime zones and regulates rights and obligations in respect of usage, development and preservation for these zones, including resource mining (Radzevicius et al., 2010). A number of regional conventions have been ratified with the aim of minimizing the impact of human activities and that include, directly or indirectly, references to aggregate exploitation. These include the Convention for the Protection of the Marine Environment of the North East Atlantic, 1992 (OSPAR Convention), the Convention on the Protection of the Marine Environment of the Baltic Sea Area, 1992 (Helsinki Convention), the Convention for the Protection of the Mediterranean Sea against Pollution, 1976, and Convention for the Protection of the Marine Environment and the Coastal Region of the Mediterranean, 1995 (Barcelona Convention). However, there are no specific guidelines for the management of marine aggregates extraction under the Barcelona Convention. Others include the Convention for the International Council for the Exploration of the Sea (ICES), 1964, the Convention on Environmental Impact Assessment in a transboundary context, 1991 (ESPOO Convention), the Protocol on Strategic Environmental Assessment, 2003 (SEA Protocol), and the Protocol on land-based sources of pollution from the Convention for the Protection and Development of the Marine Environment in the Wider Caribbean Region (Cartagena Convention). The governance is not coherent and includes several layers of regulations between national and international conventions. There are no global standards (Velegrakis et al., 2010; Radzevicius et al, 2010). Sand and gravel represent the highest volume of raw material used on earth after water. Their use greatly exceeds natural renewal rates. Moreover, the amount being mined is increasing exponentially, mainly as a result of rapid economic growth in Asia (UNEP and CSIRO, 2011). Negative effects on the environment are unequivocal and are occurring around the world. The problem is now so serious that the existence of river ecosystems is threatened in a number of locations (Kondolf, 1997; Sreebha and Padmalal, 2011). Damage is more severe in small river catchments. The same applies to threats to benthic ecosystems from marine extraction (Krause et al., 2010; Desprez et al., 2010; Boyd et al., 2005). A large discrepancy exists between the magnitude of the problem and public awareness of it. The absence of global monitoring of aggregates extraction undoubtedly contributes to the gap in knowledge, which translates into a lack of action. As this issue is truly a major emerging one, there is a need for in-depth research. The implementation of a monitoring mechanism regarding global aggregate extractions and trade would shed light on the magnitude of this issue and bridge the current data and knowledge gap (Velegrakis et al., 2010). This would also raise this issue on the political agenda and perhaps lead to an international framework to improve extraction governance, as the current level of political concern clearly does not match the urgency of the situation. Special thanks to Jacqueline McGladeb, Lindsey Harrimanc, Zinta Zommersb, Ron Witta, Andrea Salinasd, Frank Turyatungae for their valuable comments, input and review, and Shelley Robertsonf for copy editing. * The idea for this publication came from the film documentary “Le Sable: enquête sur une disparition,” directed by Denis Delestrac and broadcast on Arte channel on May 28, 2013. Al-Rawas, A.A., Wahid Hago, A., Taha, R., Al-Kharousi, K., 2005. Use of incinerator ash as a replacement for cement and sand in cement mortars, Building and Environment, 40, 1261-1266. Aquaknow, 2014. Sand mining- the ‘high volume – low value’ paradox. Aquaknow. 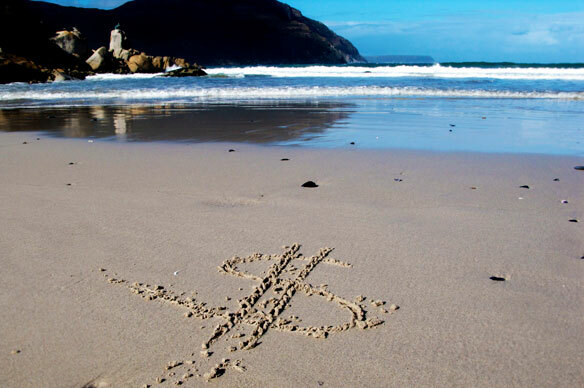 http://www.aquaknow.net/en/news/sand-mining-high-volume-low-value-paradox/ (accessed 03.02.14). Ashraf, M.A., Maah, M.J., Yusoff, I., Wajid, A., Mahmood, K., 2011. Sand mining effects, causes and concerns: A case study from Bestari Jaya, Selangor, Peninsular Malaysia. Scientific Research and Essays 6(6), 1216-1231. Au fait, 2011. Pillage et vol de sables de mer et des dunes du littoral : Le Conseil de gouvernement adopte un projet de loi incriminant , 4 May 2011. Au fait. http://www.aufaitmaroc.com/actualites/science–environnement/2011/5/4/le-conseil-de-gouvernement-adopte-un-projet-de-loi-incriminant#.UvANMva5e2w (accessed 03.02.14). Boyd, S.E., Limpenny, D.S., Rees, H.L., Cooper, K.M., 2005. The effects of marine sand and gravel extraction on the macrobenthos at a commercial dredging site (results 6 years post-dredging). ICES Journal of Marine Science 62, 145-162. Chauhan, S.S., 2010. Mining, Development and Environment: A Case Study of Bijolia Mining Area in Rajasthan, India. J. Hum. Ecol. 31(1), 65-72. Cisse, A., Tamba, S., Lo, M.L., Diop, M.B., Sissoko, G., 2012. Contribution to Improving the Performance of Concrete: The Case of the Use of Desert Sand of the Region of Dakar. Research Journal of Environmental and Earth Sciences 4(12), 1071-1078.
Cooper, K.M., Curtis, M., Wan Hussin, W.M.R., Barrio Froján, C.R.S., Defew, E.C., Nye, V., Patterson, D.M., 2011. Implications of dredging induced changes in sediment particle size composition for the structure and function of marine benthic macrofaunal communities. Marine Pollution Bulletin 62, 2087–2094. De Leeuw, J., Shankman, D., Wu, G., de Boer, W.F., Burnham, J., He, Q., Yesou, H., Xiao, J., 2010. Strategic assessment of the magnitude and impacts of sand mining in Poyang Lake, China. Reg. Environ Change 10, 95-102. DOI 10.1007/s10113-009-0096-6. Delestrac, D., 2013. Le Sable : enquête sur une disparition, film documentary broadcast on Arte channel, May 28, 2013. Desprez, M., Pearce, B., Le Bot, S., 2010. The biological impact of overflowing sands around a marine aggregate extraction site: Dieppe (eastern English Channel). ICES Journal of Marine Science 67(2), 270-277. Economiste (2005) La guerre du sable, l’Economiste, edition N°2063, 15 July 2005. http://www.leconomiste.com/article/safi-la-guerre-du-sable (accessed 03.02.14). EDE, 2013. Environment Data Explorer, Total road network, Source: International Road Federation, World Road Statistics, GRID-Geneva, United Nations Environment Programme. http://ede.grid.unep.ch/ (accessed 03.02.14). EDE, 2014. Environment Data Explorer; Emissions of CO2 — from Cement Production (CDIAC), GRID-Geneva, United Nations Environment Programme. http://ede.grid.unep.ch/ (accessed 03.02.14). Ghosh, D., 2012. Sand mafia truck mows down cop. The Times of India, June 12, 2012. http://articles.timesofindia.indiatimes.com/2012-06-12/india/32194116_1_pcr-van-dumper-sand-mafia (accessed 03.02.14). Global Witness, 2010. Shifting sand — How Singapore’s demand for Cambodian sand threatens ecosystems and undermines good governance. Global Witness, London. pp. 48. Guerin, B., 2003. The shifting sands of time — and Singapore, Asia Times online, 31 July 2003. http://www.atimes.com/atimes/Southeast_Asia/EG31Ae01.html (accessed 04.02.14). Handron, B., 2010. Singapore accused of launching sand wars, The Telegraph, 12 February 2010. http://www.telegraph.co.uk/news/worldnews/asia/singapore/7221987/Singapore-accused-of-launching-Sand-Wars.html (accessed 04.02.14). IPCC, 2013a. Summary for Policymakers, in: Stocker, T.F., Qin, D., Plattner, G.-K., Tignor, M., Allen, S. K., Boschung, J., Nauels, A., Xia, Y., Bex, V., Midgley, P.M. (Eds. ), Climate Change 2013: The Physical Science Basis. Contribution of Working Group I to the Fifth Assessment Report of the Intergovernmental Panel on Climate Change. Cambridge University Press, Cambridge and New York. IPCC, 2013b. Climate Change 2013: The Physical Science Basis. Contribution of Working Group I to the Fifth Assessment Report of the Intergovernmental Panel on Climate Change. Stocker, T.F., D. Qin, G.-K. Plattner, M. Tignor, S.K. Allen, J. Boschung, A. Nauels, Y. Xia, V. Bex and P.M. Midgley (Eds.). Cambridge University Press, Cambridge and New York. Jan De Nul group, 2013. Land Reclamation and Beach Replenishment, project U.A.E., Palm Island II in Dubai, 2002-2008. Jan De Nul group. 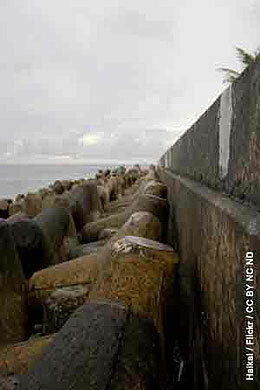 http://www.jandenul.com/en/activities/dredging-and-marine-works/land-reclamation-and-beach-replenishment (accessed 01.09.13). John, E., 2009. The impacts of sand mining in Kallada river (Pathanapuram Taluk), Kerala, Journal of basic and applied biology, 3 (1&2), 108-113. Jones Lang LaSalle, 2013. Dubai real estate market overview. Jones Lang LaSalle. http://www.joneslanglasalle-mena.com/ResearchLevel1/JLL_DXBQ2%202013.pdf (accessed 01.09.13). Khamput, P., 2006. A study of compressive strength of concrete using quarry dust as fine aggregate and mixing with admixture Type E. Department of Civil Engineering, Rajamangala University of Technology, Thailand. Khardijamal, 2011. Maroc – Safi : La menace de la “guerre des sables” continue. Aug. 9, 2011. Khardijamal. http://khardijamal.wordpress.com/2011/08/09/maroc-safi-la-menace-de-la-guerre-des-sables-continue/ (accessed 04.02.14). Kondolf, G.M., 1994. Geomorphic and environmental effects of instream gravel mining. Landscape and Urban Planning 28, 225–243. Kondolf, G.M., 1997. Hungry water: effects of dams and gravel mining on river channels. Environmental Management 21(4), 553-551. Krause, C., Diesing, M., Arlt, G., 2010. The physical and biological impact of sand extraction: a case study of the western Baltic Sea. Journal of Coastal Research 51, 215-226. Krausmann, F., Gingrich, S., Eisenmenger, N., Erb, K-H., Haber, H., Fischer-Kowalski, M., 2009. Growth in global materials use, GDP and population during the 20th century. Ecological Economics 68, 2696-2705. Mahasenan, N., Smith, S., Humphreys, K., 2003. The Cement Industry and Global Climate Change: Current and Potential Future Cement Industry CO2 Emissions, in: Gale, J., Kaya, Y. (Eds. ), Greenhouse Gas Control Technologies. Proceedings of the 6th International Conference on Greenhouse Gas Control Technologies 1-4 October, 2002, Kyoto Japan. Elsevier Science 2, 995–1000. Maya, K., Santhosh, V., Padmalal, D. Aneesh Kumar, SR., 2012. Impact of mining and quarrying in Muvattupuzha river basin, Kerala – an overview on its environmental effects. Bonfring International Journal of Industrial Engineering and Management Science 2(1), 36-40. Milliman, D., Syvitski, M., 1992. Geomorphic/Tectonic Control of Sediment Discharge to the Ocean: The Importance of Small Mountainous Rivers. J. Geol. 100 (5), 525-544. Milton, C., 2010. Sand smugglers, 4 Aug, 2010. Foreign Policy http://www.foreignpolicy.com/articles/2010/08/04/the_sand_smugglers (accessed 03.02.14). New York Times, 2010. Indonesia’s Islands Are Buried Treasure for Gravel Pirates, March 28, 2010. The New York Times. http://www.nytimes.com/2010/03/28/weekinreview/28grist.html?_r=0″ (accessed 03.02.14). Padmalal, D., Maya, K., Sreebha, S., Streeja, R., 2008. Environmental effects of river sand mining: a case from the river catchments of Vembanad Lake, Southwest coast of India. Environ Geol. 54,879-889. DOI 10.1007/s00254-007-0870-z. Radford, T., 2005. It’s the way you tell them, Environment & Poverty Times, 3, Special Edition for the World Conference on Disaster Reduction January 18-22, 2005, Kobe, Japan, UNEP/GRID-Arendal. Radzevicius, R., Velegrakis, A., Bonne, W., Kortekaas, S., Gare, E., Blažauskas, N., and Asariotis, R., 2010. Marine Aggregate Extraction Regulation in EU Member States. Journal of Coastal Research 51, 15-38. Robinson, R., Brown, M., 2002. Sociocultural Dimensions of Supply and Demand for Natural Aggregate—Examples from the Mid-Atlantic Region, United States, U.S. Geological Survey Open-File Report 02-350. Saviour, N., 2012., Environmental impact of soil and sand mining: a review. International Journal of Science, Environment and Technology 1(3), 125-134. Sonak, S., Pangam, P., Sonak, M., Mayekar, D., 2006. Impact of sand mining on local ecology in multiple dimension of global environmental change. The Energy and Resources Institute, New Delhi. Sreebha, S., Padmalal, D., 2011. Environmental impact assessment of sand mining from the small catchment rivers in the Southwestern Coast of India: a case study. Environmental Management 47, 130-140. DOI 10.1007/s00267-0109571-6. Steinberger, JK., Krausmann, F., Eisenmenger, N., 2010. Global patterns of materials use: a socioeconomic and geophysical analysis, Ecological Economics, 69, 1148-1158. Thornton, EB., Sallenger, A., Conforto Sesto, J., Egley, L., McGee, T., Parsons, R., 2006. Sand mining impacts on long-term dune erosion in southern Monterey Bay. Marine Geology 229, 45-58. Tillin, H.M., Houghton, A.J., Saunders, J.E., Drabble, R. and Hull, S.C., 2011. Direct and Indirect Impacts of Aggregate Dredging, Marine Aggregate Levy Sustainability Fund (MALSF). Science Monograph Series 1, 1-46. UN Comtrade, 2014. Import of Natural sand except sand for mineral extraction as reported. United Nations Commodity Trade Statistics Database. http://comtrade.un.org (accessed 04.02.14). UNEP and CSIRO, 2011. Resource Efficiency: Economics and outlook for Asia and the Pacific. United Nations Environment Programme, Bangkok. USGS, 2012. The 2010 Minerals Yearbook- Cement. U.S. Geological Survey, Reston. USGS, 2013a. Cement, statistics and information. U.S. Geological Survey, Reston. USGS, 2013b. Sand and gravel (construction) statistics, in: Kelly, T.D., Matos, G.R., (Eds. ), Historical statistics for mineral and material commodities in the United States. U.S. Geological Survey Data Series 140, Reston. USGS, 2013c. The 2011 Minerals Yearbook, Cement, U.S. Geological Survey, Reston. Velegrakis, A.F., Ballay, A., Poulos, S., Radzevicius, R., Bellec, V., Manso, F., 2010. European marine aggregates resources: Origins, usage, prospecting and dredging techniques. Journal of Coastal Research 51, 1-14.DOI: 10.2112 / SI51-002.1. Zhang, G., Song, J., Yang, J., Liu, X., 2006. Performance of mortar and concrete made with a fine aggregate of desert sand, Building and Environment. 41, 1478–1481.